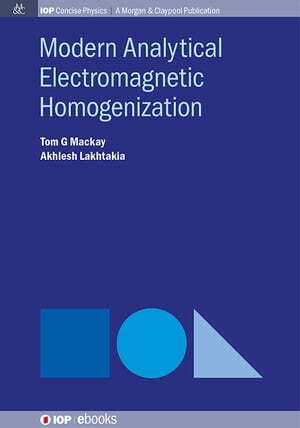 Collins Booksellers - Modern Analytical Electromagnetic Homogenization by Tom G Mackay & Akhlesh Lakhtakia, 9781627057097. Buy this book online. Electromagnetic homogenization is the process of estimating the effective electromagnetic properties of composite materials in the long-wavelength regime, wherein the length scales of nonhomogeneities are much smaller than the wavelengths involved. This is a bird’s-eye view of currently available homogenization formalisms for particulate composite materials. It presents analytical methods only, with focus on the general settings of anisotropy and bianisotropy. The authors largely concentrate on ‘effective’ materials as opposed to ‘equivalent’ materials, and emphasize the fundamental (but sometimes overlooked) differences between these two categories of homogenized composite materials. The properties of an ‘effective’ material represents those of its composite material, regardless of the geometry and dimensions of the bulk materials and regardless of the orientations and polarization states of the illuminating electromagnetic fields. In contrast, the properties of ‘equivalent’ materials only represent those of their corresponding composite materials under certain restrictive circumstances.